For 74 years the Melody Maker was the weekly 'trade paper' for the dance band and jazz musician as well as all those interested in the modern music scene. First published in 1926 it continued until it was taken over by the New Musical Express in 2000. During it's lifetime it survived major changes in the demands of the musical public and the music profession. One of it's continuing features and talking points were the annual Readers Polls where readers voted under different categories for individual musicians, singers, big bands and a host of other categories. Esquire Records used these poll results to form and record hand picked modern jazz groups. Esquire recorded the Melody Maker All Stars as they were called, from 1951 until 1955. The first "Waxing the Winners" record was a success and with the close co-operation of the Melody Maker editor Pat Brand the records became an annual event. A number of other groups were recorded with Melody Maker as part of the title. In 1954 Mike Nevard, a reporter for the Melody Maker organised a couple of recording dates for the All Stars for two American labels, MGM and Blue Note. After 1955 when Esquire stopped recording, Nixa took over and recorded a handful of tracks under the All Stars name for another two years. The Melody Maker name had been attached to a number of earlier recordings. The first time was in 1942 and then when there was increasing interest in bebop in 1947, Melody Maker and Columbia Records organised the Melody Maker's Jazz Rally. Unfortunately, few of the tracks recorded are available on CD. 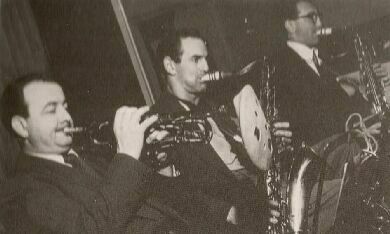 The very first recording in 1942 was not a 'modern jazz' group but a number of the musicians went on to have careers in the jazz environment. This was recorded as a tribute to the second world war effort of Britain's Merchant Navy, the proceeds from the sale of the record went to provide comforts for the sailors. Dave Wilkins, Kenny Baker, Tommy McQuater (tp), George Chisholm, Woolf Phillips (tb), Harry Parry (cl), Harry Hayes (as), George Evans, Aubrey Frank, Reggie Dare (ts), George Shearing (p), Joe Deniz (g), Tommy Bromley (b), Jock Cummings (d). Red Duster Rag*/Red Duster Rag. With the increasing interest in the new modern jazz sounds at this time, the 'Melody Maker' and 'Columbia Records' held a joint jazz rally at which the Harry Hayes Band and the Woolf Phillips group played. 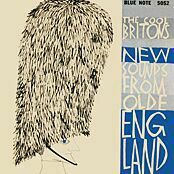 'Blue Moon' includes a relaxed flowing solo from Ronnie Scott (then a big toned tenorman), and good contributions from Pete Chilver and George Shearing. Reg Arnold played a solo hinting at something different to his usual swing sound. Dave Wilkins (tp), Woolf Phillips (tb), Harry Parry (cl), Reggie Dare (ts), Ralph Sharon (p), Pete Chilver (g), Jack Fallon (b), Norman Burns (d). Who's Sorry Now (part 1)/Who's Sorry Now (part 2). Kenny Baker (tp), Gordon Langhorn (tb), Ronnie Chamberlain, Henry McKenzie (cl), Ronnie Scott (ts), Johnny Dankworth (as), Dave Shand (bs), Victor Feldman (vib), Ralph Sharon (p), Ivor Mairants (g), Charlie Short (b), Jack Parnell (d). Esquire's first 10" LP recorded the winners in the 1951 Melody Maker readers poll. Leap Year (2 takes, one take on*)/Up The Poll (2 takes)/M.M.Special (Part 1)/M.M.Special (Part 2). Kenny Baker (tp), Jackie Armstrong (tb), Vic Ash (cl), Les Gilbert (as), Ronnie Chamberlain, (sops), Ronnie Scott (ts), Martin Slavin (vib), Bill McGuffie (p), Ivor Mairants (g), Johnny Hawksworth (b), Jack Parnell (d). Ballot Box (2 takes, one take on*)/Anidina/Coronation Jump (2 takes). For Voters Only# (2 takes, one take on*)/Gallop Poll (2 takes, one take on*)/Swingdido*. Don Rendell (ts), Johnny Dankworth (as), Albert Hall (tp), Ralph Dollimore (p), Johnny Hawksworth (b), Allan Ganley (d). Deep Purple*/Rhumblues/I'll Remember April/Amalgam/Two Sleepy People. 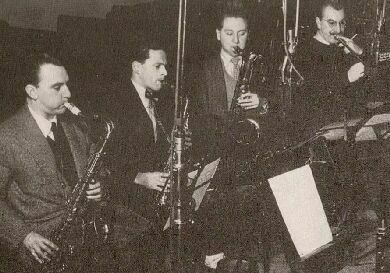 John Dankworth (as), Don Rendell (ts), Harry Klein (bs), Albert Hall (tp), Ralph Dollimore (p), Johnny Hawksworth (b), Tony Kinsey (d). Quick Returns*/Crystal/I'm Putting All My Eggs In One Basket(1)/Jazz Club USA/Nom De Plume/Epigram. Gershwin Ballad Medley: (Summertime/Someone To Watch Over Me/Love Walked In/Embraceable You)/Waxing The Winners (Part 1)/Waxing The Winners (Part 2). Top score*/Mood Indigo*. (Other titles on this LP are by Kenny Baker's Half Dozen, Dill Jones Trio, Vic Ash Quintet, Don Rendell jazz Six and Cleo Laine). Tubby Hayes (ts), Ronnie Ross (bs), Bill Le Sage (vib), Dave Goldberg (g), Johnny Hawksworth (b), Allan Ganley (d). Hark Dog*. (Other titles on this LP by Lennie Felix, Polka Dots, Kenny Baker All Stars, Cleo Laine, and Vic Ash Sextet). This page was last updated during January, 2010.